Hydrogen is an essential industrial chemical used in a variety of applications. Its major end use is in the petroleum refining industry to refine crude oil. With the growth in concern of climate change and global warming, hydrogen is the fuel of the future. As India is in the process of becoming a developed country, the need for cleaner fuel to produce power is projected to increase. The hydrogen fuel cell provides a greater solution to meet this growth in demand for power. The major driving factor that is responsible for the growth of the hydrogen market in India is the surge in demand for hydrogen in the end-user industry. Furthermore, use of hydrogen in power generation and stringent environmental regulations towards cleaner form of energy have fueled the market growth. However, high transportation and storage cost of hydrogen and stagnant pricing of hydrogen hampers the market growth. On the contrary, liquid organic hydrogen carrier (LOHC) technologies for storage and transportation of hydrogen are expected to boost future opportunities for the market growth. The report segments the India hydrogen market based on delivery mode, technology, end user, and region. By delivery mode, the market is divided into captive and merchant. On the basis of technology, the market is categorized into steam methane reforming, partial oxidation of oil, coal gasification, methanol reforming, ammonia cracking, and electrolysis of water. Considering the end user, the market is classified into chemical, petroleum refining, metal processing, glass industry, edible fats and oils, energy, and others. Region-wise, it is analyzed across North India, South India, Western India, and East India. 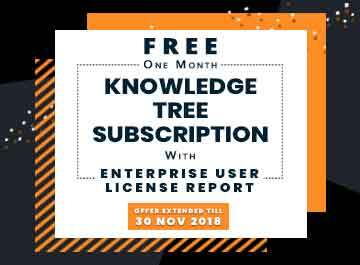 The key players operating in the market include Praxair India Private Limited, Linde India Limited, INOX Air Products, Bhuruka Gases Limited, Air Liquide India, Aditya Birla Chemicals (India) Ltd., Gujarat Alkalies And Chemicals Limited, DCW Limited (DCW), TATA Chemicals Limited, and GHCL Ltd. 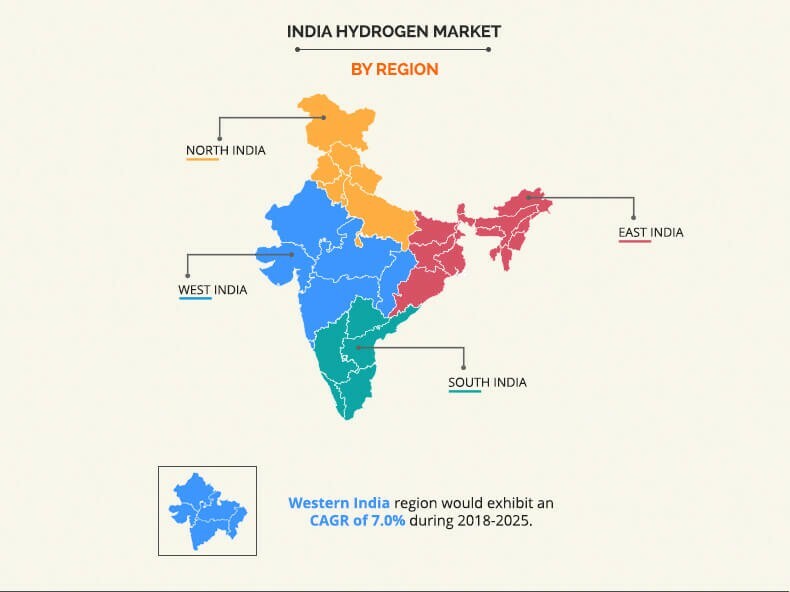 The Western India hydrogen market is expected to witness rapid growth rate during the forecast period, owing to increase in the hydrogen demand for use in hydrogen fuel cells. 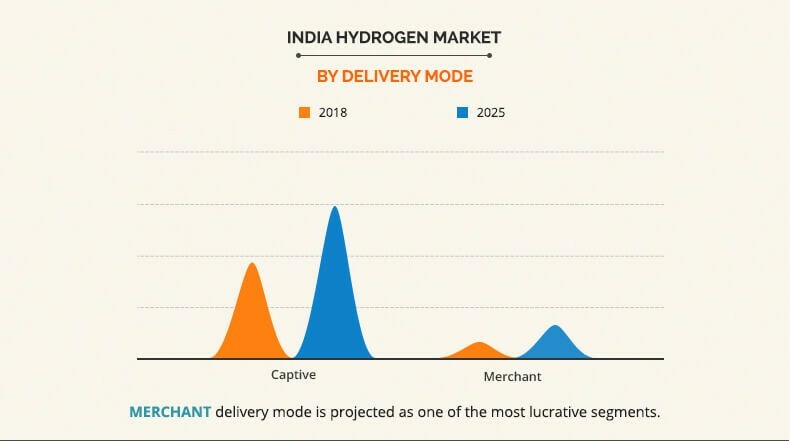 The merchant segment is projected to be the most lucrative segment, owing to increase in demand for hydrogen by various end-user industries. The partial oxidation of oil segment holds a dominant position in 2018 and is predicted to continue to maintain the lead throughout the forecast period, owing to various factors related to the quality of the hydrogen produced. The hydrogen produced through this process, typically, has a purity ranging 97-98%. Porters five forces analysis helps to analyze the potential of buyers and suppliers and the competitive scenario of the industry for strategy building. It outlines the current trends and the future scenario of the India hydrogen market from 2018 to 2025 to understand the prevailing opportunities and potential investment pockets. The major regions are mapped according to their individual revenue contribution to the India market. 8.1. Praxair India Pvt. Ltd.
8.6. Aditya birla chemicals (india) ltd. 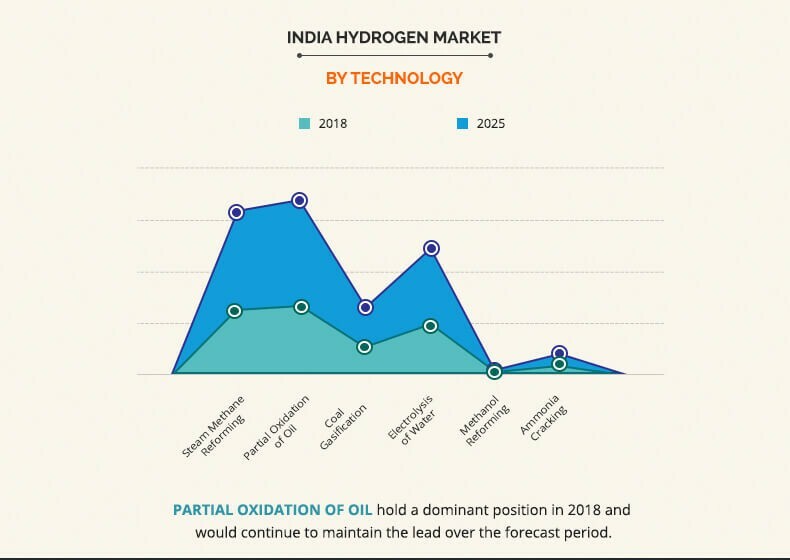 The India hydrogen market has reported a significant growth in recent times, owing to an increase in demand for hydrogen in the end-user industries, such as petroleum refining processes, metal processing, automotive original equipment manufacturer (OEM), glass, edible fats & oil, and others. Moreover, implementation of stringent environmental regulations toward a cleaner form of energy drives the growth of the India hydrogen market. One of the major trends observed is the growing use of hydrogen in power generation, which is further expected to boost the market growth. The use of liquid organic hydrogen carrier (LOHC) technologies for storage and transportation of hydrogen is expected to offer potential growth opportunities for the market.